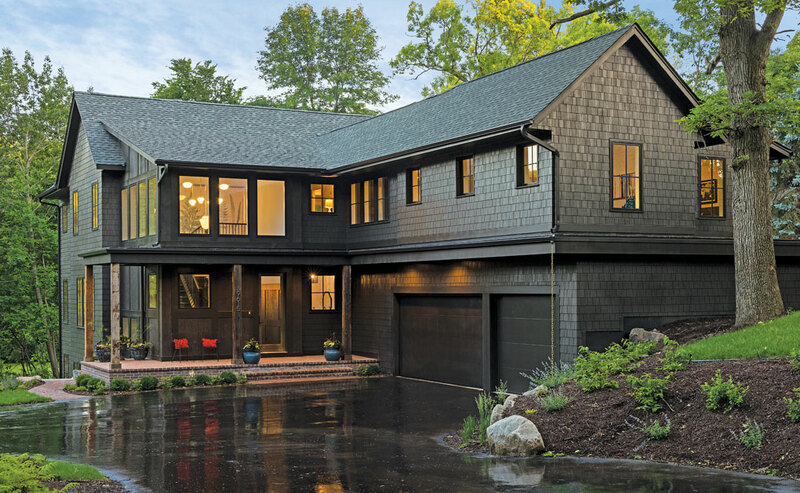 The home’s exterior palette and shingle siding were inspired by the rugged Oregon coast. 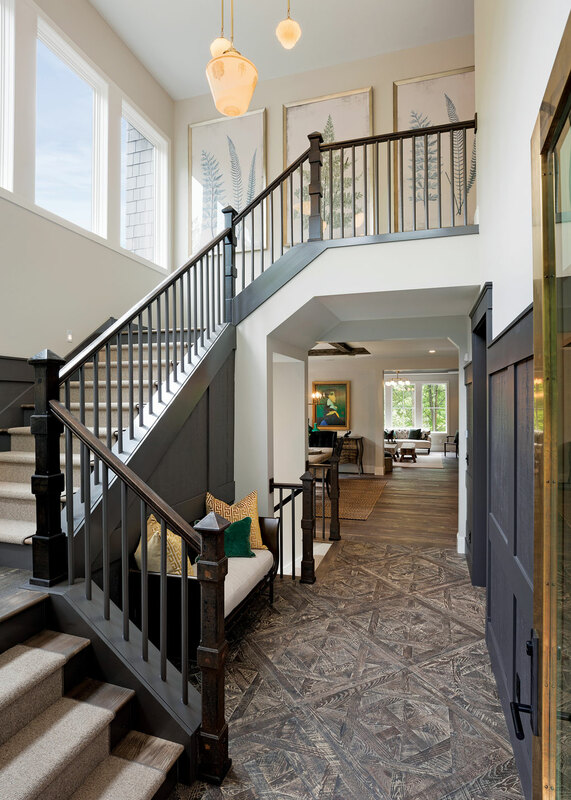 The entry is distinctive, from the brass-wrapped front door to the customized finish of the parquet flooring to the salvaged newel posts and vintage milk-glass lighting that hangs overhead. He and partner Tom Preissing took some risks with this unique house—on the market for $1.595 million—but they knew what they were doing. The color palette, inspired by a visit to the rugged Oregon coast, is warmly welcoming. The style, rural Victorian with a dash of art deco and soft industrial, results in a pleasing collected look that feels comfortable and modern. 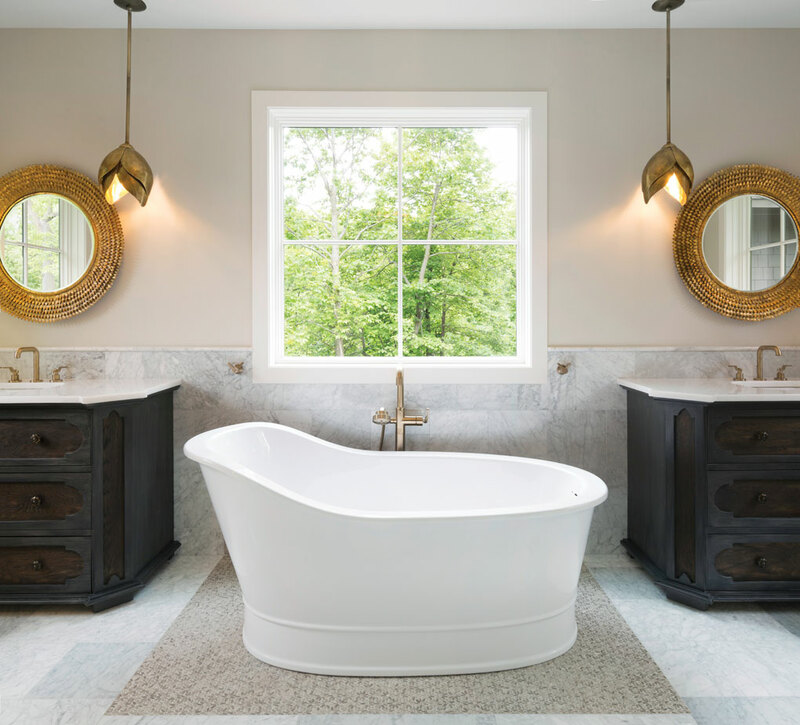 The master bath, spotlights a soaking tub and dual vanities with Art Deco-style lighting. “Many of the architectural salvage pieces were borrowed from the Victorian era, but they were used in such a different way, I don’t think it really has a Victorian feel,” says interior designer Stacia Winkler of Vintage Elements. She customized many of the repurposed pieces in the house to make them more relevant. 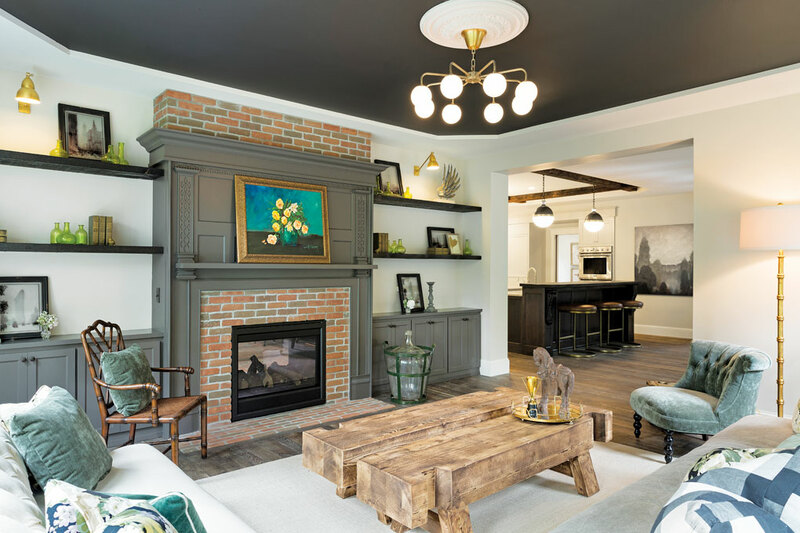 The living room features a two-sided fireplace, reclaimed and painted mantel, and ceiling medallion. 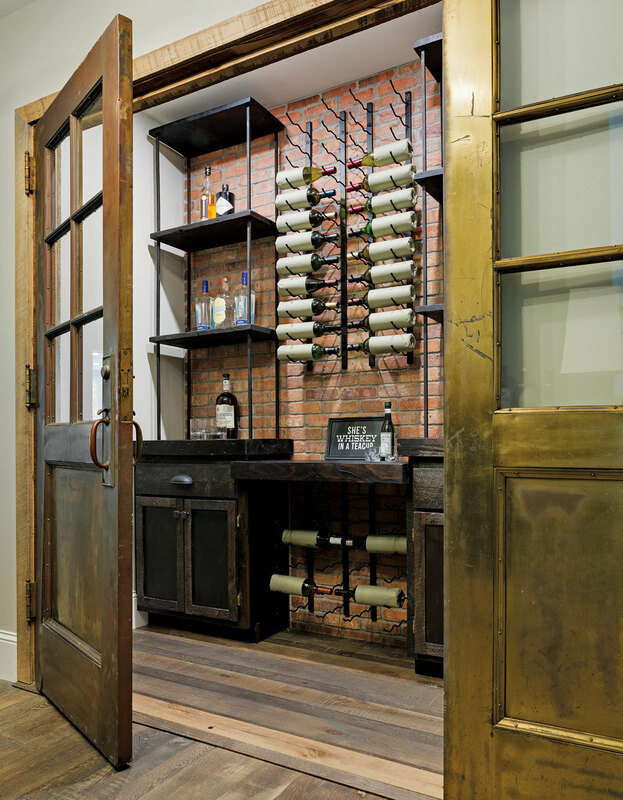 A deliberate walkabout in the home reveals additional architectural salvage that is artfully repurposed. The stair railing in the front foyer, for example, is bookended by reclaimed iron posts. “We could only get three, so we cut the additional wood posts in the same shape,” says Winkler. The fireplace mantel in the great room, also reclaimed and then painted to match the built-in cabinetry and millwork, still shows off its dentil molding and fluted columns with the kind of wood joinery used at the turn of the century. Such architectural finds are sprinkled throughout this house, giving it distinction and building in character. The 5,047-square-foot two-story with walkout lower level is also configured to be livable, versatile, and family-friendly. The kitchen includes two islands—one with a baking station and mixer lift. 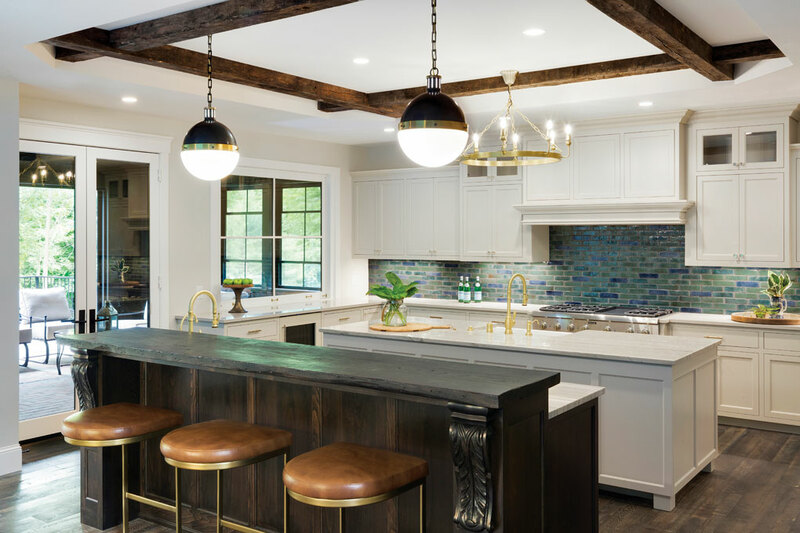 Quartzite tops the working surfaces, while a backsplash of handmade tiles offers earthy contrast. The main level flows from the entry to kitchen to dining area to living room. Tray ceilings adorned with reclaimed timbers demarcate the spaces yet maintain the open feel. A spacious kitchen with double islands, dual sinks, and two dishwashers ensures convenient entertaining, cooking, and prep. 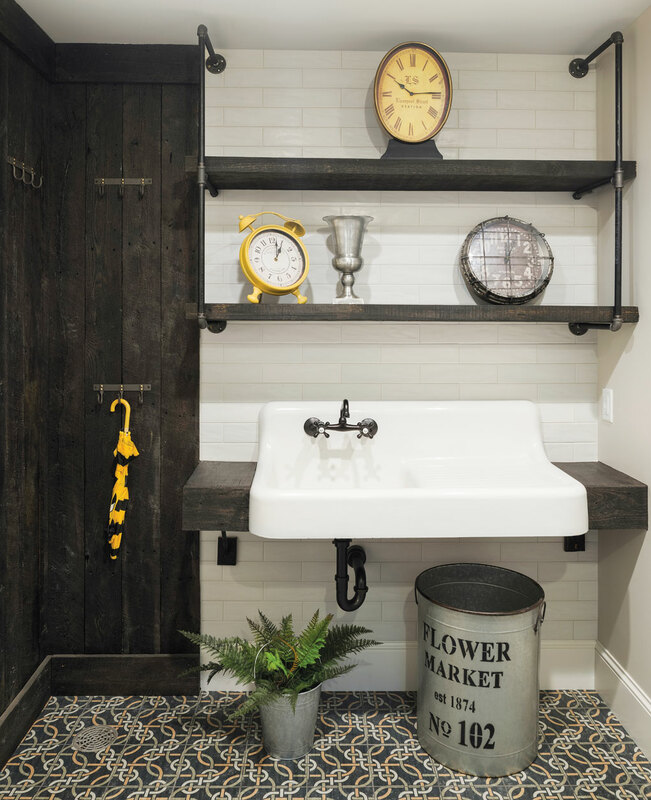 The nearby pantry/mudroom includes a desk, freezer, storage, and with vintage sink and cunning shelving fashioned from reclaimed timber and pipefittings. The cafe window between the screen porch and kitchen eases serving and entertaining. 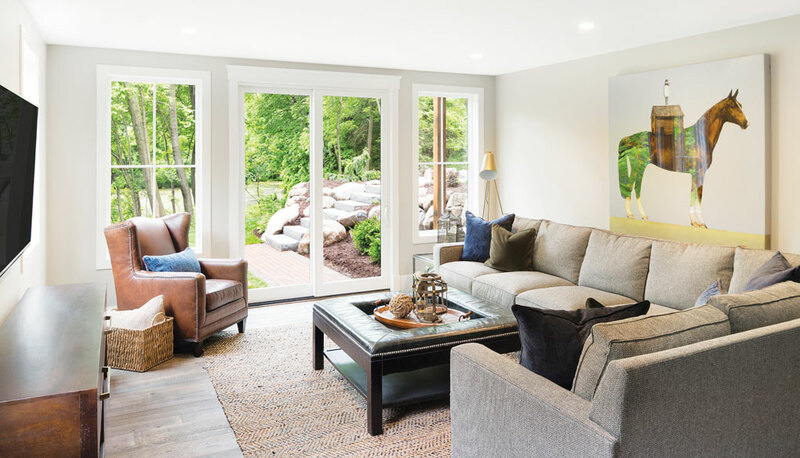 A screen porch off the kitchen, its usable season expanded by a screen wall that opens to a terrace that overlooks a private nature preserve, features a double-sided fireplace and a TV. 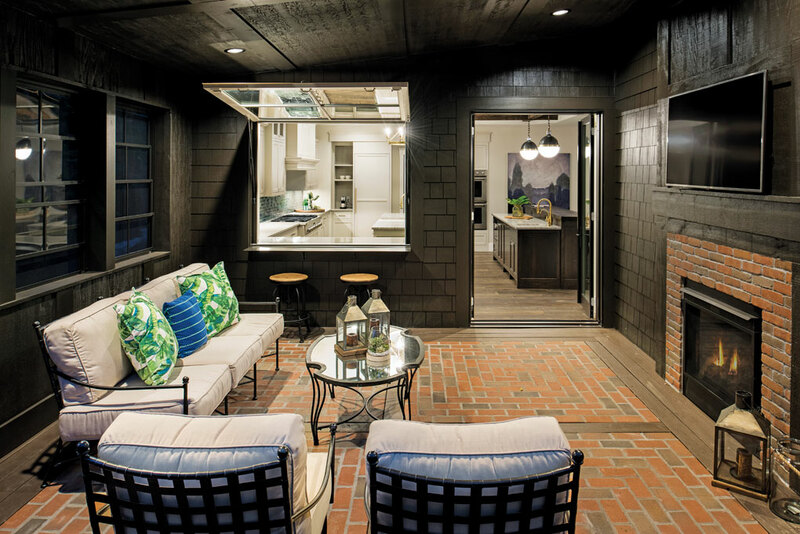 From the kitchen, a five-foot-wide cafe window opens to the porch, easing pass-through, while a beverage fridge positioned below the window in the kitchen is at hand for restocking porch partiers. The master bedroom features tray ceilings outlined with reclaimed timbers. Upstairs, the master suite unfolds beneath another tray ceiling with timbers. The bedroom includes custom-made cabinets, spacious closets, and a lovely bath with striking Art Deco-style pendants over each vanity and the soaking tub. Also on this level are three additional bedrooms, one en-suite and two that share a bathroom, a roomy laundry room, and TV/study/hang-out room with three built-in window seats. 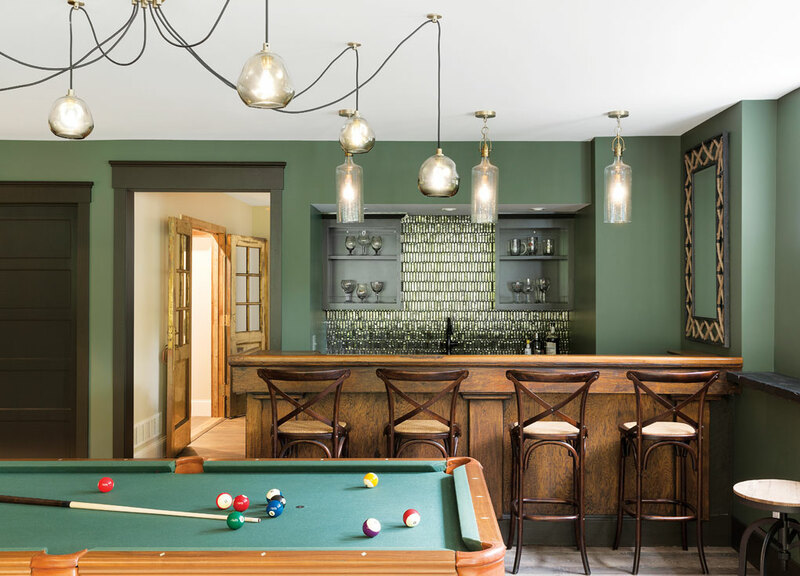 The lower-level bar, also a vintage find, gets a touch of glam from its lighting and glass-tile backsplash. Around the corner from the pub is a wine and bourbon cellar and a tasting area. These patinaed brass doors, salvaged from a city hall, inspired the brass used throughout the house. • Scherer Bros. Lumber Co.